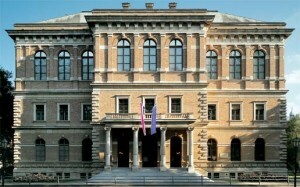 The Croatian Academy of Sciences and Arts is the highest scientific and artistic institution in the Republic of Croatia. It was founded in 1861 by Bishop of Đakovo, Josip Juraj Strossmayer (1815–1905). The Academy´s main tasks are to promote and organize scientific research, to develop artistic and cultural activities, to publish the results of scientific research and artistic creation, to make proposals and give opinions on the promotion of sciences and arts in the field which are of special importance to the Republic of Croatia and to develop international relations with other academies and scientific organizations. The Academy is divided into nine departments. Within its structure it has scientific institutes of different scientific fields, as well as the library, the Strossmayer Gallery of Old Masters, Glyptotheque, the Croatian Museum of Architecture, Department for Prints and Drawings, the Archives, the Oriental Collection, Arboretum Trsteno and the Memorial Collection of Maksimilijan Vanka, Korčula. The Academy has different categories of membership: regular members or fellows of the Academy (up to 160 members), associate members (up to 100) and corresponding members (up to 100 members). The elections for new members are held every two years.